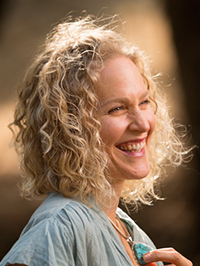 Joanna Adler, PsyD, CHT, is a Depth Hypnosis Practitioner, a licensed Clinical Psychologist and an Adjunct Instructor at the Foundation of the Sacred Stream. She holds a doctorate degree in Clinical Psychology from the California Institute of Integral Studies, where she specialized in the study of Transpersonal Psychology and Family Psychology. Joanna has been working with individuals, couples, and families as a psychotherapist since 1993. She has trained extensively in the fields of Applied Shamanism, Buddhist Psychology, Energy Medicine, and Depth Hypnosis, and teaches nationally and internationally in these fields. Joanna recently completed a pilot study of Depth Hypnosis, which offers clear evidence of the efficacy of Depth Hypnosis in treating depression, anxiety, and PTSD, and raising well-being. Joanna maintains a private psychotherapy and hypnotherapy practice, and has office hours in San Rafael, California.